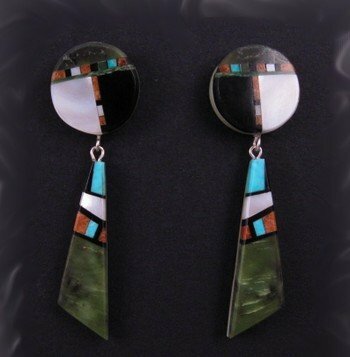 Chris Nieto of Santo Domingo Pueblo created these lovely earrings featuring a mosaic inlay of all types of semi-precious stones & shells - apple coral, serpentine, turquoise, Mother of Pearl, black jet, & more. The earrings measure 2-1/4 long, by 5/8 wide at its widest point, and 1/4 thick. Each earrings weighs 4.9 grams. Chris has etched his initials CTN for Christopher Thomas Nieto on the back of one earring and SDP for Santo Domingo Pueblo on the back of the other. Christopher Nieto is a young artist from Santo Domingo Pueblo. All of his beads are handmade and his mosaic inlay work is second to none in its quality of craftsmanship. He has won many awards. Brand New and in perfect condition. Purchased directly & in person from the artist. Certificate of Authenticity and Gift Box included with your order.